These are just a few of the chants that could be heard at the March 10th demonstration in San Francisco. Approximately 300-400 Tibetans and Westerners from across the Bay Area turned out for the march. The day's events started across the bay in Berkeley, where Berkeley Mayor Shirley Dean and Berkeley Councilmember Kriss Worthington participated in a Tibetan Flag raising ceremony. That ceremony was attended by about 150 people, mostly Tibetans. Both Mayor Dean & Councilmember Worthington gave speeches marking the occasion. Ugyen Tsering, Vice-President of the Tibetan Association of Northern California also gave a speech commerating the occasion. By 11am hundreds of Tibetans and Tibet supporters had gathered at Powell & Market in San Francisco. We sang the Tibetan National Anthem, observed a Moment of Silence for the 1.2 million Tibetans killed, and listened to a statement by US Congressional Representative Nancy Pelosi read by Catherine Dodd, her District Director. Tibet Justice Center President Dennis Cusack and leaders of other Bay Area Tibet Support Groupss gave speeches. Berkeley Councilmember Kriss Worthington elated us by repeating his Berkeley speech. A surprise appearance by Tom Amianno, former San Francisco Mayoral candidate and President of the San Francisco Board of Supervisors brightened the start of the San Francisco demonstration. 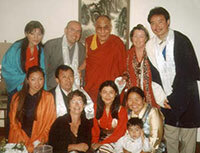 "The Dalai Lama's message of compassion and non-violence is what it is all about." said Amianno. The march was led by a vehicle from which a large picture of His Holiness the IV Dalai Lama was displayed from out of the sun roof. It was very encouraging to see hundreds of people marching the streets of San Francisco for Tibet. We proceeded to City Hall where we were met by the press. His Holiness the IV Dalai Lama's statement was read from the steps of City Hall as local reporters from TV Channels 2,7, & 5, and a Spanish TV station showed up. We left City Hall and marched toward Geary Street where the procession stopped at St. Mary's Cathedral. The Gyuto Tantric monks led a 15 minute prayer session where we prayed for all those suffering persecution in China and for all sentient beings. We prayed specifically for Christians, Muslims, Buddhists and other spiritual practitioners suffering from persecution in China. listened to a speech by Marjery Farrar, the representative from US Congressional Representative Tom Lantos's office. Her speech was fiery. She lambasted the Chinese for the human rights abuses in Tibet and China. 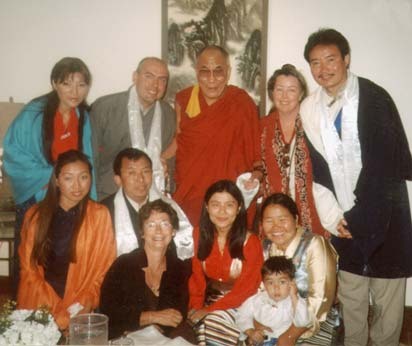 She reminded us all that even if we had good or bad days during our crusade for a Free Tibet that the important thing was that "we never failed to show up. And we keep showing up until Tibet is Free!" She looked directly at the Consulate as she spoke directly to the consular members she knew were inside and appealed to them to not listen to their leaders. The demonstration culminated with a thoughtful and well-done skit by Students for a Free Tibet. In this skit, Tibetans and Westerners reenacted beatings of Tibetans by Chinese soldiers, as the SFT Regional Coordinator recited a haunting narration about the Tibetan tragedy and the Chinese occupation of Tibet. The skit ended with the group burning larg, paper Chinese flags. I am told that we received coverage by several of the TV stations, 2, 4, & 7 and that the coverage of the march continued on the following day. We were also featured in a Berkeley newspaper. This amount of attention is rather heartening. There is a deep satisfaction in being on the right side of history, even when it takes a while for the rest of the world to catch up!